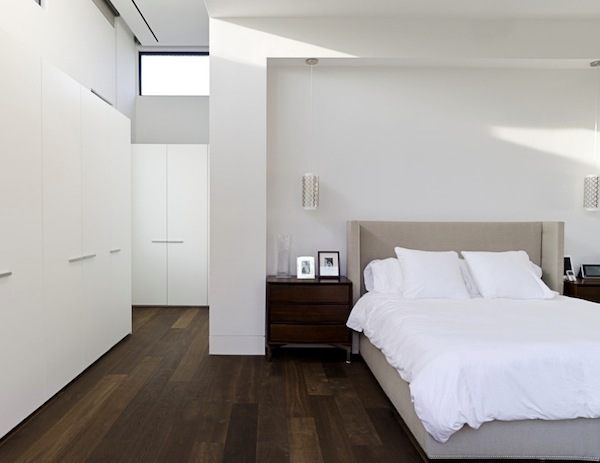 One of the most common rooms to use timber flooring in is the bedroom. Oak or wood floors are much nicer to walk on when you’re warming up for the winter and would rather not step on freezing tile. They hide sound, are easy to clean and hide dirt well. Dark wood floors in particular make an excellent feature in itself. When you walk into a dark wood floored bedroom, you really notice all of the accents even more. Here are a few bedroom ideas for furnishing and decorating to go with your dark wood floors. Dark wood is gorgeous, and making your whole floor a French Marseilles or an Italian-inspired Perugia means you will get an instant touch of cooler hues when you walk into the room. However, darker materials do tend to shake off light. Having large windows with light curtains can balance this out, keeping as much natural light in as possible. Because dark wood is already a feature piece, you should go easy on the other features you have. However, you can enhance the wood by drawing attention to one or two pieces of brightly coloured furniture, like a couch, chair, dresser, or even the bed. Keep dark shelving units, but try a bright primary colour for another piece. Don’t get too ambitious though – it’s easy to look a bit too cluttered with more than two bright colours in the bedroom. You can use two, including one feature and one accent colour. If you’re interested in giving your bedroom a bit of a cool-grunge or industrial look, try using chromatic furniture such as chairs, desks, light fixtures, or tall boys. Alternatively, accenting your furniture with gold trim and pairing it with a gold mirror frame is a perfect pair with a dark wood floor feature. To provide a pleasing contrast, keeping your white walls the opposite colour of your flooring is the ultimate sophisticated and modern look. Keeping tall plants is a great way to brighten up a room with dark floors. Try bamboo shoots as a simple way to create a perpendicular framing, and goes well next to a bed. Otherwise, you can put shorter potted plants on a side table or near a window. Plants can have a small but significant effect on the environment of your room too, helping you to breathe easier. To prevent your bedroom from looking too sterile, try installing low hanging ceiling lights. Whether these are classic chandeliers or more modern lights with dark casings, you’ll be able to bring as much light into the centre of the room as possible when natural light is not possible. Get the look yourself. Find your nearest retailer of Wildoak wood flooring or give us a call at 1300 916 526.